What on Earth is China Building in the Middle of the Desert? 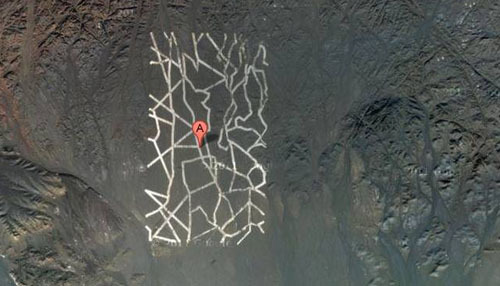 Mysterious Structures in the desert can be seen on satellite images, what are the Chinese are up to anyway? The internet has been speculating over the pictures that show remarkable buildings and structures in the Gobi Desert. 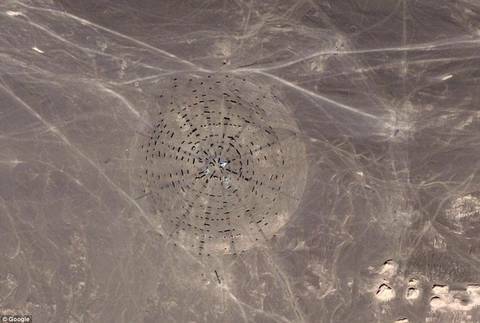 The gadget site Gizmodo has gathered several of the pictures that apparently show remarkable structures and facilities at a distance form the mysterious patterns. One of the most remarkable pictures, which is located above this article, shows a several hundred meters wide seemingly random pattern of white stripes. Among the theories is the explanation that the massive patterns should be targets for practice by military satellites.Or maybe missiles? hmm.. Many of the images are captured on the border of Gansu and Xinjiang in China’s northeast, an area where land based equipment for use by the aerospace and military industries. When zooming in on some pictures you can see the burnt out planes and trucks, which may indicate that the site has been used as targets. It is also difficult to see if the structures have been dug up or painted on the ground, making the mystery thickens. Getting no response from Chinese authorities about what actually happens is that not many people hope for.